If you are just starting out and want a dutch oven, buy a 12 inch Lodge cast iron dutch oven and you will have a high quality, versatile, camping tool that will serve you well - end of story, go start cooking. Don't compare prices, don't try to find the best deal, just trust me and thousands of other dutch oven cooks that know Lodge is a good investment. Griswold dutch ovens were manufactured until the late 1950s when the company went out of business. Collectors still value Griswold dutch ovens. There are other companies that no longer make dutch ovens, including MACA, Wagner, and Vollrath. Le Creuset dutch ovens are fancy, enameled pots for use in your kitchen oven. They don't have legs for use outdoors. Dutch ovens come in different styles, metals, sizes, and qualities. Take the following list with you to the store or refer to it when you buy online to make sure you purchase a good, usable item. It's easy to buy the wrong thing so take a few minutes to understand the features and costs of various dutch ovens. - your oven must have three legs to keep it off the coals. This lets you set the oven on the ground and slide hot coals under it as needed. Don't accidentally purchase a bean pot kettle thinking it is a dutch oven - you need to have legs. Make sure the legs are thick where they connect to the oven. Skinny legs may poke through the bottom of the oven if it gets too hot and more ovens are stacked on top. Also, don't get legs that are just short 1/2 inch nubs. The legs should be at least over an inch high. - a wire loop attached on opposite sides of the dutch oven. It should be heavy gage wire, not thin, easily bent wire that might melt. The spots where the bail is attached should be molded parts of the kettle, not riveted in place. The rivets can rust out, melt out, or break off. The bail should be easily raised and lowered, not catching on the lid. It should also stand on its own at about a 45 degree angle so it is up and away from the heat and easy to grab with a lifting tool. Rimmed - rim keeps coals and ash on the lid and prevents them from falling in the food when it is removed. Handle - there should be a handle molded into the center of the lid. It must have a hollow space between the handle and lid so you can slide a lid lifter under it to lift. A handle riveted on or a solid handle with no space will not work well. Tight-fitting - check that the lid fits snugly on the kettle with no gaps all the way around. This is required to keep steam inside and prevent food from drying out and burning. Curved - the inside of the lid should be concave so that it can be placed upside down on coals and used as a fry pan or gravy maker. - check that the sides of the kettle are an even thickness all around. Also check the quality of the cast. A cheaper cast may have pits and have more excess metal at the mold seams. A rough surface on the cast is actually ok since it may hold the 'seasoning' better than a very smooth surface when you start to use it. - The debate between cast iron and aluminum is still going strong and probably will be for years and years. Please read the next page if you are wondering the Pros and Cons of each type of dutch oven. 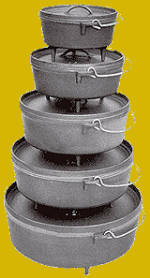 - Lodge is a well-respected American company that makes solid dutch ovens. They have the required features and are good quality casting. You can find less expensive imports, but the quality of those products has historically been poor. Considering a dutch oven is something you will pass down to your grandchildren some day, spending a few dollars more for high quality is a good investment. Great article! For the 12 inch, do you like the 6 or 8 quart? @Craig - The 8 quart has extra depth that lets you cook bigger chunks of meat, like chickens or roasts, if you think you might do that. But, it's a little heavier and the heat from the lid is farther from shallower foods. That just means you might want to move a coal or two from under the oven to the top and cook a little longer. I was wondering would it be better, if you're not sure what size ta get, should you get the larger 12" 8 quart, and will it still cook the vegetables and other foods like them without burning. I have a 10 inch and 12 inch lodge Dutch oven, I can't find lodge 14 inch Dutch oven anywhere under $200 any suggestions or locations? @Dave - Yes. See the comment I left immediately above yours. My girlfriend and I are vegetarians and love camping. I also happen to love cooking. I'm looking for a double duty Dutch oven that will work for camping and for at home use. Mainly for stews, soups, chili, sides, and the occasional cobbler or dessert. I'm wondering what size would be good for our uses. @Jen - A Lodge 12-inch camp dutch oven works for me. Make sure it has legs and is plain cast iron, not enameled. I was wondering if you could help me out. We have a 12" dutch oven that we make cobblers in while camping. I would like to know if I double my recipe if that will effect the outcome of the cobbler? Or do I move up in size of the oven? What would your recommendation be for doubling up on my recipe or getting a bigger dutch oven? @Terry - Doubling the ingredients in the same size dutch oven means the food item will be very thick and will most likely not cook properly in the center. For stews, soups, and such it's ok, but nor for baking and your cobblers would probably not turn out very well. Since you already have a 12", you could buy a second 12" and cook twice the amount of one item. Or, you could get a 16" and double the ingredients in one pot - but that's heavy and more expensive. I am wanting to purchase one for camping AND home use, are the legs absolutely necessary or would a "bean pot" be ok to use in a camp fire and home as well? Dude, just bought the book. Can't wait to try some recipes. Getting into this DO kick since I was getting ready for a camping trip and i found a 12" Setup by Camp Maid on a deal site. It has a pretty cool lid lifter/holder,a multi-tool stand, and other accessories for using your DO in ways most folks wouldn't even think they could. Are you familiar with them? What do you think? @Robin - Without the legs of a 'camping' dutch oven, you would need to set the oven on a few rocks to keep it from smothering coals underneath it. Legs really are important - so is a lid with a lip around the top to help hold coals and keep ash from falling into your food. @Gene - Yes, I've seen the Camp Maid stuff. I've not had my hands on their gear so I can't say how well made it is, but their gadgets appear to broaden your cooking options. I have enjoyed cooking in Lodge Dutch Ovens for more than 40 years. I have owned as many as 25 Dutch Ovens when I used to cook for groups of up to 500 people. I agree that the 1st oven should be a 12 in. 6 quart. The second, a 10 in. 4 quart and the third a 12 in. Deep 8 quart. This will allow you to easily cook a main course, a side dish and a dessert for groups of 6 to 12 people, depending on what you cook. I recommend that you get the Camp Dutch Ovens with the feet and flanged lids. However, in a pinch you can purchase just a flanged lid that might fit a non-legged Dutch Oven so that you can put coals on the top, and set the oven on a lid stand so that you can put coals on the bottom. But I have often cooked with my Camp Dutch Oven (with feet) inside in my stove without any problem, the feet fit nicely between the rods of the oven grate..
You can use a dutch oven without legs when camping, but it's easier if you have a tripod with a chain to hang the pot over a fire. Not as good for baking as it's harder to control the heat, but it's great for roasting, soups & stews. Is the brand Wenzel a good choice? @Hugo - There are lots of lesser known brands of cast iron. Many of them are not worth the few dollars less than you'd pay for Lodge. A quick search for wenzel shows some people like them and lots of people don't. Some people say it is made in china, but I don't know. There are many wenzel items for sale on ebay and other online "get rid of stuff I don't want" sites. Thanks for your site, btw. @Joey - Cowboy Stew and/or Fizzy Fruit Cobbler. I really enjoy Dutch Oven cooking, but a friend of my mom gave her a 11 inch Dutch oven with legs. It has 11 stamped on the handle. It's been in the attic since the early 80's. But I'm having trouble locating a 11 inch lid for it. I'm not sure who made it, I tried looking at the Lodge Factory store in South Pittsburg for scratch and dent lid sale, but no help. Any ideas? Dutch Oven Dude, I have a Camp Chef triple burner. If I get the DO with legs, will it still cook ok on the Camp Chef? Should I set it on the griddle or just right on the grill? Or should I get the DO without legs? I am looking forward to trying your recipes! Thanks for the great information! @Steve - You can only do frying or liquid cooking, like soups, on a stove. To cook and bake, you need to have coals on top of the DO. If you get one with no legs, it will sit easier on your grill, but you won't be able to cook and bake with it unless you rig up some rocks or bricks or something to keep it from smothering the coals under it. I've found that the three legs on a DO usually fit between grill crosspieces just fine and the bottom of the DO rests on the grill. Don't set it on a griddle because it will take forever to heat up. Thank you Dutch Oven Dude! Just bought your book and will get a DO with legs per your advice. Looking forward to trying it out! Looking for a Lodge 16 camp dutch oven. Lodge discontinued them in '13 and I can't find one anywhere. @Troy - Some possibilities - look on ebay.com or on craigslist.org for used items. Check with idos.org or find a dutch oven society near you. Or, get a Camp Chef brand instead. @Troy - You can't get better quality than Lodge. Camp Chef, TexSport, and other foreign-made brands have poorer reputations, but in general are fine products, I think. Camp Chef's reputation is better these days. I've seen a few that have irregular casting, and some lids that don't fit well - very, very bad. But, if you check out an item before purchase, you can make sure it's good. Lodge cast iron is USA-made (except for their enameled items) which alleviates the "China toxic stuff" concern for some. The only non-Lodge dutch oven I have is a rectangular, aluminum Woody Dutch Oven that works great, especially for enchiladas. I am just going to try and be patient and hold out for a Lodge. How many serving not quarts does a 12 in DO serve? I'm making a Beef Enchilada casserole. @Spencer - Well, servings and quarts go together. The number of servings a recipe makes depends on how big a serving is, and the number of quarts define how big of a casserole can be made. A 12-inch DO is typically either 6-quart or 8-quart capacity, just depending on its depth. If you made 6 quarts of casserole and figured each serving was 1 cup then you'd have 24 servings. If you said a serving was 2 cups (1 pint) then you'd have 12 servings. I simply wanted to say thanks! I am new to dutch ovens and this page is exactly what I needed! I have a 10" and a 12" and am now considering something bigger. What do you recommend between a 12"D or a 14"? Both are 8 qt, but I wondered if it is harder to cook in a D vs a regular depth oven. I don't cook large meats like a whole ham or chicken often. I'm more looking for quantity......meats and stews to feed a larger number of people. Thoughts? @Dave - I don't think it's any more difficult in a deep DO, just a bit more heat on top helps. A 14 would be more useful for what you want. A wider platform would heat faster, allow larger pizzas, more enchiladas, etc. You could stack your three easier, if you like to do that. We are trying to find a really large lodge cast iron Dutch oven. My father in-law had a kidney transplant and we held an auction to help with medical bills. Someone donated a large Dutch oven for the auction. We can not find one close to the same size. Any ideas? Thank you !! @Debra - "really large" is how big? 14 inch DOs are available, but larger than that are harder. Camp Chef makes a 16 inch, and MACA used to make up to 22 inch. MACA left the dutch oven mfg business in 2013, but the Happy Camper site says they can get some made as a special order - check here. Do you know if Lodge is planning on bringing the 16 camp oven back? I heard because of the high demand for skillets they had to stop production of less popular items like the 16CO and others. Now they have the new foundry up and running increasing production by 75% I'm finding fewer reasons for Lodge not to have a full line of camp dutch ovens again. Not sure which dutch oven size to get for a larger roast for 12 people. Any specific size recommended? @Andrew - Lodge 16-inch dutch oven is listed on Amazon.com but not available. It seems that they'd be able to sell a lot of them if they start making them again. Fingers crossed. @Mary - A 10 quart, 14-inch deep oven could be enough. I would use two 8 quart, 12-inch deeps and make two smaller roasts. I recently inherited a 14" Dutch Oven, without legs. It is contained within a wood crate, primitive nails, no screws, with a sliding top lid that has a metal plate held by hammered rivets as a finger pull with hole for a small lock. Plate is labeled COMPT. C PORT on it. Looks to be bronze or maybe brass, but not corroded. All research to ID this Dutch Oven fails on Google. Is there any expert out there that can identify what I have? No maker name, only crude raised 14 on lid and the numbers are cockeyed from one-another. on top outer edge of lid, 1 groove or dent mark and opposite side on top edge, 2 grooved dent marks. someones forge marking obviously. My brother was the owner, passed at age 69. He was age 10 when the oven was given to him by an 83 year old man, a California rancher and was supposedly that mans fathers. I'd sure like to track down the maker and correct age of this oven. Any help appreciated. Thanks. I am in search of a very large Dutch oven with legs... pretty sure no one makes them anymore. Any idea on where to look for really large used Dutch ovens? I have #16 lodge Dutch Oven. Was told our mom bought in the 70’s. Could that be true? Anyone know the years they where made? @Steve - Lodge stopped making 16-inch around 2000, then came back around 2003, then stopped in 2013. Other brands are still made. @Devon - There are quite a few brands making 16-inch dutch ovens. Larger than that are more difficult to find. Ebay often has some available. Wondering if I can use recipes for a 12” DO in a 10”, 4 qt. @Dave - I cook on the ground, no tables. A windbreak is definitely helpful on windy days, but a thin, light sheet of tin (or just aluminum foil) works well for me. I don't use disposable liners, but occasionally use pie tins, depending on the food. @Karen - Yes, you would just reduce the ingredient amounts by about 1/4. I ran into someone who told me that "way back when" Lodge made a 18 inch Dutch Oven. Is this true? I have only ran into the 16 inch version. These 16 inchers must be pretty rare now as on Ebay they are selling for $400-$500. Very good informative page. Especially on 16 inch Dos.